This is a Stock build Managed Pressure Drilling (MPD) manifold which has been designed and manufactured by MTC to automatically maintain the annulus surface back pressure during balanced or underbalanced drilling operations within a predetermined pressure operating window using a set of two tight shut off capable pneumatically actuated full bore drilling chokes controlled by a PLC based control system to maintain the selected set point pressure and an HMI interface panel for operator input of required settings and for displaying control system input and output parameters. A fully integral double block and bleed API 4 1/16” 5000psi WP Gate valve manifold design with independent flow paths to dual pneumatically actuated API 4 1/16” 5000psi 3” ID full bore tight shut off capable drilling chokes and including a full bypass or gut line capability. 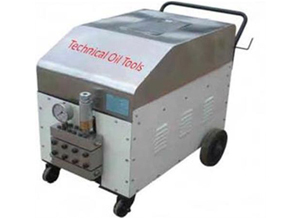 An integrated air powered hydraulic control panel is included to allow easy and rapid activation of the manifold hydraulic valves. 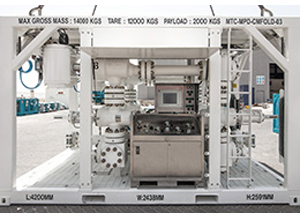 The complete manifold assembly is installed in an offshore DNV 2.7-1 approved skid and crash frame with lifting sling set and fork lift pockets and includes an integrated instrumentation air distribution system, explosion proof lighting and large general purpose toolbox. A Zone 1 Eexd enclosure and an intrinsically safe operator control panel enclosure which houses the touch screen HMI panel and set of control options selection switches to control the MPD choke manifold functions. A set of intrinsically safe pressure and temperature transmitters to provide the input to the control system and an intrinsically safe integrated alarm beacon and sounder system all inter-connected via armoured cable and explosion proof Zone 1 glanding. The choke control system software has been designed to automatically control the Pneumatically actuated drilling chokes either independently or in parallel to accurately maintain a pre-determined upstream set point pressure using a set of very user friendly switching and touch screen interface options to accurately maintain the selected set point pressure during the MPD drilling operations. Listed below are the main Operational and Safety features of the MPD manifold and control system. 100% operational redundancy of the Drilling chokes. Digital and backup mechanical choke position readouts on Drilling chokes. Fail in last position logic in case of power failure on Drilling chokes. Option of flow and density monitoring and recording from standalone Coriolis meter manifold. Includes fixed choke mode for more accurate back-pressure control at higher flow rates. 100% redundancy of the upstream and downstream pressure transmitters. Includes upstream and downstream temperature transmitters. Choke failure and choke plugging logic activates audible and visual alarms. Includes permanent recording of all control system events and input-output data. Double block and bleed API gate valve philosophy on choke and bypass line flow paths. 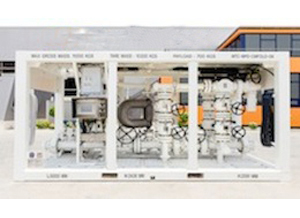 Includes set of integrated 30 meter long SCADA and WITS extension cables to allow remote operation of the manifold control system and additional independent data output to WITS when required.